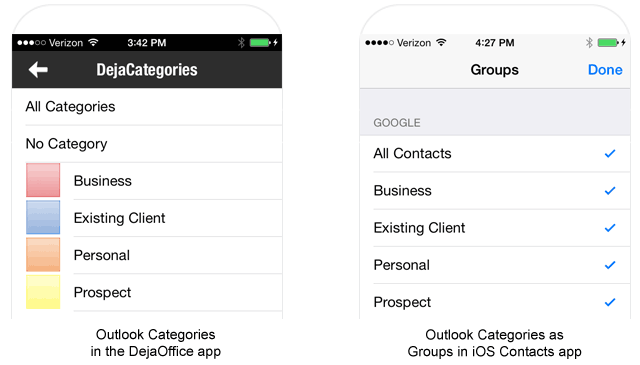 This entry was posted in DejaOffice, Tips and Tricks and tagged outlook categories iphone, outlook color categories on iphone by Rushang. Bookmark the permalink. Does anyone know if the Outlook colour categories are viewable in Outlook on the iPhone. In our office we have 1 email box & we assign each email with a colour, when it arrives. Each colour represents a person! The colour assigned does not show on the iphones. We use office 365 so everything is stored in the cloud – surely this is possible?? Hi, any update on this? In particular, am I correct in understanding that this app does not sync the colour categories assigned to emails in Outllook to the ipad/iphone? Has anyone found a way of doing that yet? Karen, thanks for the question. CompanionLink products synchronize Contacts, Calendar, Tasks, Notes, and Journal. We do not sync email because email is not something that is synchronized. Email is downloaded from the mail server, and the phone does that without needing add-on products. Let me know if it doesn’t work. We have free phone support so can get it to work. Hi Michelle, I’m wondering if CompanionLink worked for your boss? I have the same issue with my boss, I categorise his e-mails so that he knows which ones are urgent, etc, however, he can’t see the categories on his iPhone.